I admit I may be a bigger fan of Will Smith than most. I grew up with him, sure, but I think it goes beyond that. The man was one of the biggest names in Hollywood for a long time. Nearly every year he came out with another hit on the top of the blockbuster titles. Beyond that, he’s just a cool dude in general that has a lot of good-spirited beliefs. Yes, I also love his music – and grew up listening to the songs nonstop as a kid. But it all started in the mid-nineties. Men in Black was one of these films that really got the film buffs to pay attention to his talents – and it’s not hard to understand why. This film primarily focuses on the life of J (Smith) after he is recruited in a top-secret government organization that deals in finding and controlling alien life on earth. His partner is K (Tommy Lee Jones). When news comes out that a bug-type alien crash landed on Earth looking for a hidden artifact that decides Earth’s fate, J and K must stop it before the world ultimately comes to an end. This is one of Will Smith’s greatest films. Even those that aren’t the biggest fans of his work would probably agree with me on that one. Yeah, a lot of his Fresh Prince of Bel-Air attitude is shining out here, but that’s fine. It’s as if the entire role was written specifically with Will Smith in mind, and he carries the role really well. The same can be said about Tommy Lee Jones, as the two of them have a really good sense of chemistry – in more ways than one. The young and the old, the rookie and the veteran, the goof and the stern man, the student and the teacher – and all of these different personalities never clash and instead feel like opposites really truly do work well together. Beyond that, our story is stitched together really well in terms of comedy and the flow of the plot itself. It’s a pretty simple saving the world from utter destruction story, but all of the characters are very colorful and work well with each other – and everything truly feels original. But beyond that, for a film that’s nearly twenty years old, it still translates incredibly well for a modern audience. The CGI in the film doesn’t always look amazing – in fact, it never matches up to today’s standards, but the whole overall tone of the film somehow makes it so the viewer doesn’t really care. The way these CGI creatures look among everything else in the film somehow looks perfect. I don’t know how they did it. It was partially practical effects and partially CGI, but they made the CGI itself look practical at times, and because of that…it works. I will say that as a whole, the film feels complete. Not only is there a great plot, visuals, and musical score by Danny Elfman, but you have a really good sense of character development – even when it’s not completely needed. It’s there just to feel more complete and more real. I can respect that. It also does a great job at introducing a fish-out-of-water element with Will Smith for the first half of the film, which in and of itself was hilarious. 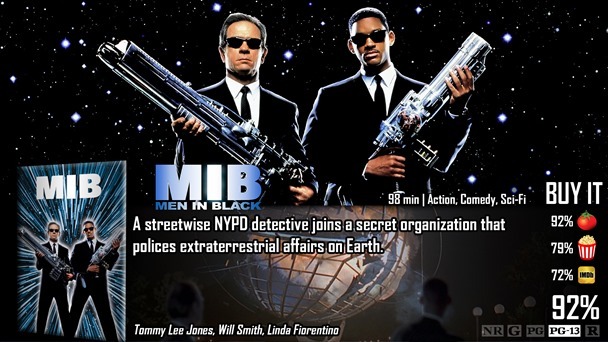 Men in Black is one of the best films Will Smith has ever been a part of. It truly feels like a complete and nearly perfect film in terms of what it was actually going for. Great musical score, good character development, great fish-out-of-water sequences, hilarious jokes and acting, great chemistry, colorful and diverse cast of characters, and a solid plot. It’s hard not to love this movie. The only thing that really comes to mind in terms of negative aspects to the film was the CGI, which obviously fails in terms of today’s standards, and these differences have the potential of turning away modern viewers. Then again, I think the CGI in the movie actually works for what it was going for…but that could just be me. I love this movie. Saw it when I was like 10 and it never looses steam in my opinion. Great review.